Price Recommended Retail Price £6.99. Subscription is available at £30 for 6 issues. Published by Morton Media Group in the UK, Aviation Classics is a series of “bookazines”, or aviation books in magazine format. These are soft-cover A4 publications, each devoted to a particular type of aircraft but otherwise following magazine conventions in terms of contents, authorship and layout. 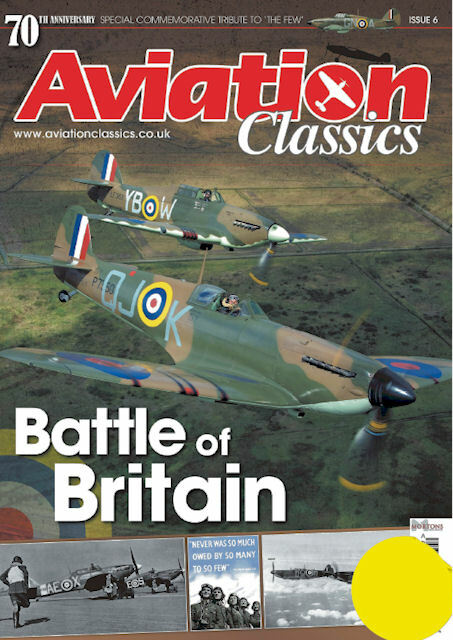 For in-depth look at the series, see Aviation Classics – Magazine Review posted previously at this site. Following the latest issue on English Electric Lightning, issue 6 of the ‘Aviation Classics’ series is a special edition published to coincide with the 70th anniversary of the Battle of Britain. Aviation Classics’ Battle of Britain would definitely be enjoyed by history enthusiasts and those with a taste for a well-illustrated aviation magazine. The title should arrive at the newsstands at the end of September. Also, back issues can be ordered via the publisher’s website.